"Go Calvin!" - Dina Hackert screams from the sidelines. * Over 199 games, Hope leads the series 103-96. * Hope has outscored Calvin by just 102 points (13,584-13,482), which works out to a difference of just 0.51 points per game. ESPN has identified the storied Hope-Calvin rivalry as the nation's greatest series in NCAA Division III, and they have it ranked fourth in all of college basketball, with Duke vs. North Carolina, Connecticut vs. Tennessee (women) and Louisville vs. Kentucky the three clashes ahead of them on the list. As the Hope-Calvin series prepares for its milestone 200th meeting on Saturday, February 2, the two schools have found that they've gotten even closer in a way that's left many in the Hope community quite perplexed and, at the same time, entertained. One of the players on Hope's basketball team is named...Calvin. "It's kind of weird," said Calvin Hackert, who is a sophomore guard for Hope. "It's all just kind of humorous." Calvin has been dealing with good natured jokes about his name since he started attending Hope in 2017. "When I started my first semester, on my first day of class, I said my name and my professor gave me a hard time," said Calvin. Both Hope and Calvin were among the colleges recruiting Calvin Hackert when he was playing basketball at Ludington High School. Calvin ultimately chose Hope. "I came to an exposure camp [at Hope] ," added Calvin. "Hope felt like the better fit for me." Calvin's teammate Riley Lewis happens to also be his college roommate. Riley admits that when he met Calvin the first time, he called his name into question. "I couldn't believe I was at Hope and living with a Calvin," said Lewis, who is a junior guard on Hope's team. "We all just call him Cal so we can avoid having to say his full name." Hope's head basketball coach Greg Mitchell has also bought into calling him Cal. "I probably could call him Calvin, but that name is pretty tough to say on our floor," said Mitchell, who's in the midst of his 5th season leading the Hope program. "[His name] is certainly is a living oxymoron." The irony behind Calvin's first name goes far deeper than the fact that Hope just happened to recruit a kid named Calvin to play for Hope. Calvin's mother was a Hope basketball legend, causing the name choice to be a bit of a head-scratcher. Dina Disney is seen here clipping down the nets, after she helped lead the Hope women's basketball team to the 1990 National Championship. 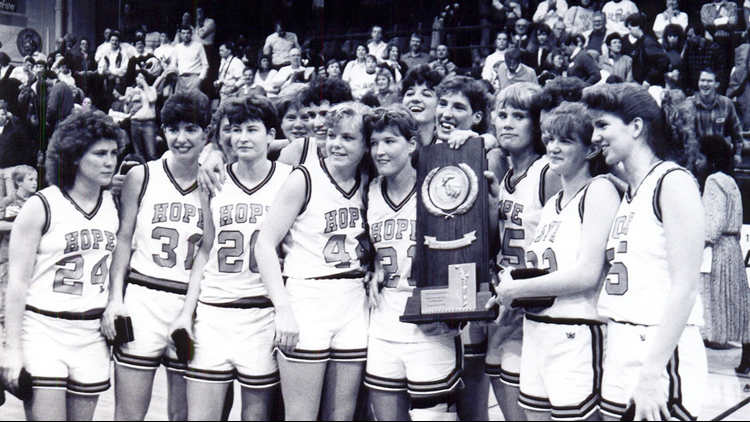 On March 17, 1990, Hope was battling St. John Fisher (N.Y.) College at the Holland Civic Center in the NCAA Division III National Championship game. It was dubbed "The Miracle on 8th Street" because Hope was trailing by 20 points with under 10 minutes left in regulation, then managed a massive comeback to win. "The game was tied [63-63] with just over 5 seconds left," said Dina Hackert, whose name was Dina Disney back then. "There was a long pass [in-bounded] and we were going full length." The pass was knocked loose and there was a scramble at center court for the ball, which happened to wind up in Disney's possession. "I got fouled," said Hackert. The clock had hit zeros. So, Disney went to the free throw line needing only to make one free throw to win the championship. "I had a Bible verse written on my shoe," said Hackert. "Philippians 4:13 -'I can do all things through Christ who strengthens me.'" She says she paused to read the Bible verse, then stepped to the line. Dina then calmly sank both free throws, clinching the championship for Hope, 65-63. Group photo taken soon after Dina Disney and her Hope College woman's basketball team won the 1990 Division III national championship. "It was an exciting time, and when I think about it all these years later, I can go back to that time in a second," added Hackert. 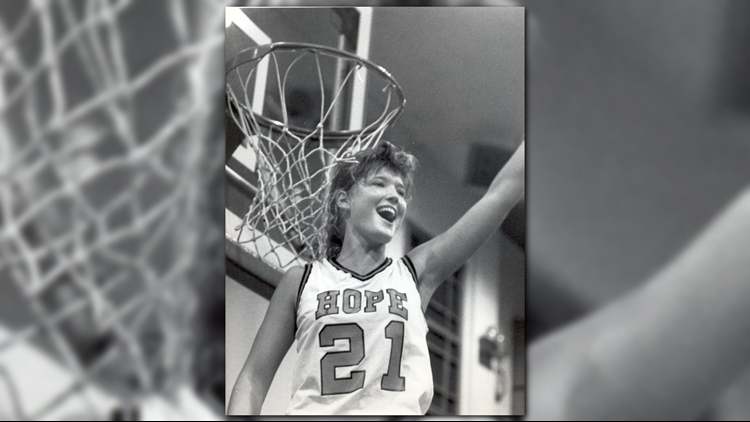 While winning the 1990 championship was the pinnacle of her basketball career at Hope, she says she's never forgot all those conference battles against Calvin College. "The rivalry with Calvin was always fiercely intense," said Hackert. "When the ball went up, it was always a war." After graduating from Hope, Dina Disney would eventually marry Jeff Hackert. She and Jeff would build a family together which included four children. Dina Disney would eventually become Dina Hackert after she married her husband Jeff. The couple would have four children, including Calvin (left). 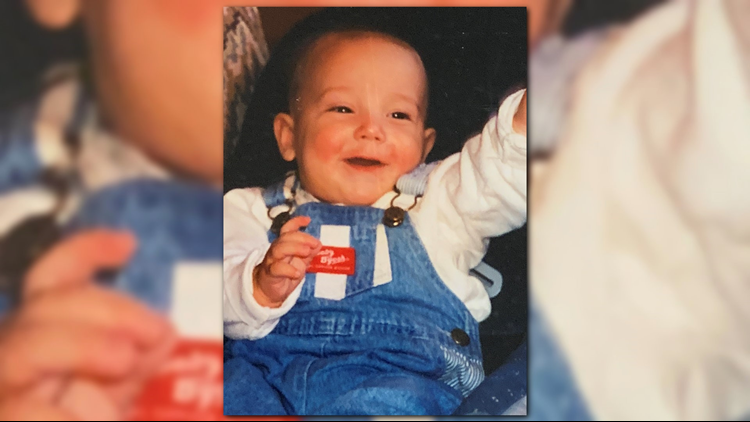 The couple decided to name their fourth child Calvin, which has brought about much discussion over the years, then intensified after Calvin started to play for Hope a year and a half ago. "After I named him Calvin, all my [Hope] teammates called me and said, 'you named him what,'" joked Hackert. "The thing is, when I named him Calvin, the rivalry against Calvin [College] never entered my mind. Calvin Hackert as an infant. "We actually named him after the comic strip called Calvin & Hobbes. I really liked the character Calvin in that comic, and that's what led me to fall in love with the name Calvin." She says when she named him Calvin, thoughts of him ever becoming an athlete, specifically a basketball player, were the furthest things from her mind. "It all just so ironic," said Hackert. "I named my son Calvin and he ends up following in my footsteps and playing basketball for Hope." A few years ago, Dina and her husband re-located from Ludington, Mich., to Brandenburg, Ky., which is two hours west of Louisville. The couple takes turns driving back up to Michigan to attend Calvin's games. If you attend Hope basketball games, and you see a woman in the crowd wearing a Hope shirt screaming, "Go Calvin", that will be Dina. Dina Hackert drives from her home in Kentucky to as many Hope men's basketball games as she can so she can watch her son Calvin play. "That sounds crazy," joked Hackert. "But I am known to yell, "Go Calvin" from time to time." What about when Hope faces Calvin? 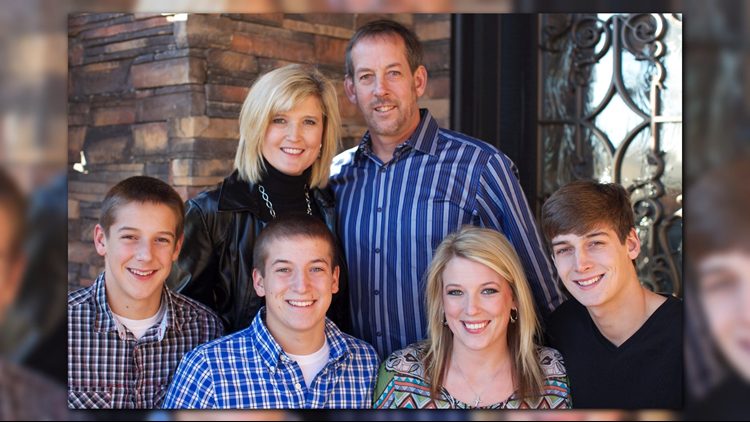 "I will have to remember to just yell, 'Go Hope,' or, 'Go son,' said Hackert. "Standing there wearing a Hope shirt screaming "Go Calvin," when Calvin is playing for Hope against Calvin, might not go over too well." For a basketball rivalry that's seemingly had it all over the past 99 years, it's never had anything like this. "Despite his name, he's an amazing guy," joked coach Mitchell. "We're thrilled that Cal chose Hope and we love how he's playing." "I still think there's more to Dina naming him Calvin than the Calvin & Hobbes cartoon theory," joked Lewis. "Cal's an interesting guy and it's funny that it happened to him." There is one certainty in all this confusion. Dina wants the best for Calvin (to clarify, her son, not the school). "My son just happens to have a name of a different color school," added Hackert. "He definitely bleeds orange and blue." So, for the next two and a half years, there will be a Calvin on Hope's team. 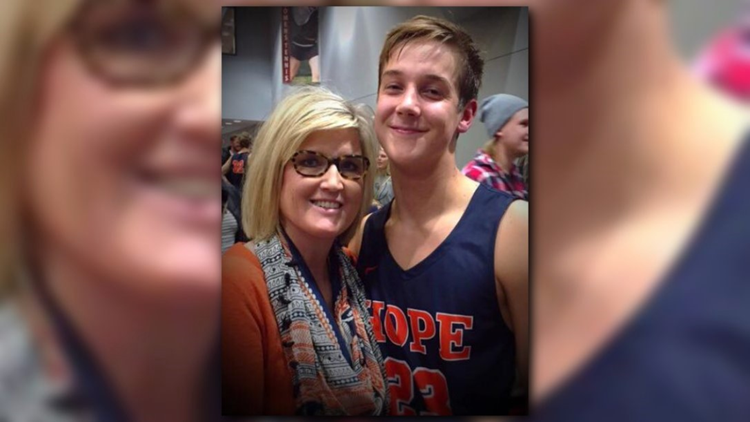 Dina Hackert posing for a photo with her son Calvin Hackert while attending a Hope men's basketball game in 2017. "It sounds completely crazy, but it's true," said Hackert. If you know of a story that should be featured on "Our Michigan Life," send a detailed email to 13 On Your Side's Brent Ashcroft: Life@13OnYourSide.com. We will be sure to follow-up.